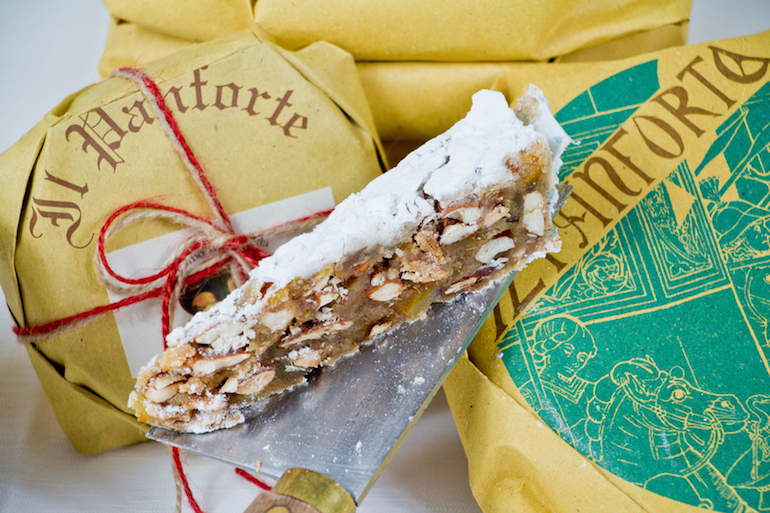 Unlike many traditional British Christmas sweetmeats, panforte is suitable for vegetarians without adaptation. You can enjoy it with coffee, tea, or even a dessert wine or vin santo. The ingredients in the recipe below are the official ones. You can of course, substitute plain flour for ‘0’, any clear honey for the millefiori, and candied lemon peel for the citron. Citron is a fruit very much like a lemon, but distinct. I’ll be blogging about it later in the week. You can also leave out the rice paper disc, if you wish, but be sure to butter the bottom of the tin in that case and to remove it before it cools completely, or it will stick. You can find a video of me making this recipe here. 1. Grease a round 22 cm (9 inch) cake tin, line the bottom with rice paper and the sides with greaseproof paper. 2. Mix the flour, almonds, and spices together in a bowl. 3. Put the sugar, honey, and water in a saucepan and heat very gently to melt the sugar and honey together. Be careful not to let the mixture caramelize. 4. Add the candied peel to the syrup and stir to coat the peel, about 30 seconds. 5. Add the syrup and peel to the flour, almonds, and spices. Mix thoroughly to form a dry but coherent mixture. 6. Place the mixture in the tin and press down with a spoon to ensure that the mixture is distributed evenly. Don’t worry if the surface is a bit rough. 7. Bake for 20 minutes at 220°C (430°F). Don’t worry if the cake seems very soft when it comes out of the oven. Let it cool down completely. 8. Remove the cake from the tin and discard the greaseproof paper. Cover the top with sifted icing sugar. Buon appetito!